This is all good information but given the way things are done I can’t see us using these project management tools. This was a sentiment expressed at the third project management training workshop of the EU-CLGF project “Localizing the Sustainable Development Goals in the Caribbean” being run by Trinidad and Tobago Association of Local Government Authorities in association with the Caribbean Network for Urban and Land Management. The workshop, held on 31st October and 1st November at the Port of Spain City Corporation, focused on Monitoring and Evaluation (M&E). 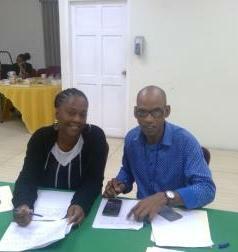 Participants form the Sangre Grande Regional Corporation, Penal-Debe Regional Corporation and Port of Spain City Corporation, along with representatives from Tunapuna-Piarco Regional Corporation and San Juan-Laventille Regional Corporation, learnt about Earned Value Analysis and calculated Cost Performance Index (CPI), Schedule Performance Index (SPI), Cost Schedule Index (CSI) and Estimate at Completion. These indices are indicators, widely used in project management to determine if the project is on schedule in terms of cost and time; if the project can be brought back on track; and, what would be the total cost at completion. The idea that the progress of a well-planned project can be tracked at this level of detail using only budgeted and actual expenditures; and that the information can allow for informed decision making during the life of the project was somewhat of a novel concept to participants. Certainly, this was not done in practice. Often, it was stated, at the local government level, the progress of the work was evaluated at the time it was scheduled to be completed; and if not completed, decisions about future of the work was determined at that point. Sometimes complaints by intended beneficiaries would alert officials to the status of the work and interventions would occur at this point. This is not to say that there is not inquiry into the progress of ongoing projects at Council meetings or among persons executing the project within Corporation, just not a fully structured format. How can we change the culture of project management in the municipal corporations, to incorporate standardized and systemic means of measuring progress? How can we utilize more quantitative measures of progress to allow for better decision making during the scheduled life of the project? One suggestion is that the participants of workshops become champions for project management by incorporating these tools in their day to day work programme and, if possible, lobbying to encourage more persons to adopt these practices. Other suggestions included spreading the message further, either through a training of trainers workshop to include more municipal corporations and/or further training in project management software and other management tools. Other relevant discussion occurred at the workshop, for example, why do projects face challenges which cause them to stop and what are the kind of solutions we should be looking for? One participant stated that if a project is properly planned, with assumptions, risks and strategies to mitigate risks clearly defined, it is less likely that drastic changes would be required during the life of the project. Of course, some assumptions may not hold or some risk management strategies may not have been adequately thought through, for example, drastic fluctuation of exchange rates in donor funded projects or unusual weather patterns affecting project completion as recently experienced in the Penal Debe and Sangre Grande Corporations. However, some challenges are often predictable, e.g. wet and dry season for construction projects, key staff members going on leave, public holidays etc., and can considered in the planning process. Should changes in the project be required, one must keep the objectives of the project in mind but also recognize that the length of time for approval (or acting without approval) can make the scenario worse. Discussions were also held on how to close out a project. Validating deliverables, releasing resources, closing out contracts, disassembling the project teams, and reviewing project documentation were discussed. Often the amount of work in closing out a project is understated and under budgeted leaving this aspect of the project in jeopardy. The financial implications of this can be tremendous as projects often do not receive the final tranche of funding until the achievement of the scope of the project has been verified. The participants were quizzed to ensure that the learning outcomes of all the workshops were achieved. The answers were reviewed and any misconceptions clarified. An online survey for persons not in attendance is planned to evaluate learning outcomes. The true test of learning outcomes will also be determined in the execution of the pilot project. An M&E activity is planned for January 2018 to ascertain how participants have implemented the project management tools as they make progress with the demonstration projects. This document has been produced with the financial assistance of the European Union. The contents of this document are the sole responsibility of CLGF and can under no circumstances be regarded as reflecting the position of the European Union.